Here is a most interesting sheet. 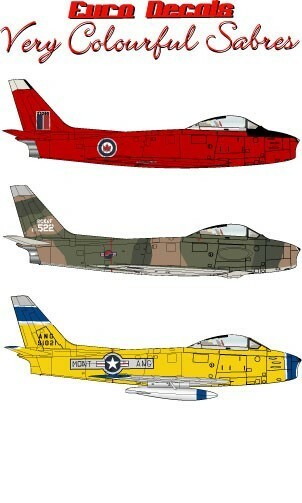 It covers some of the most colorful F-86s that I have seen. What is more, they are available in both 1/72 and 1/48 scale. 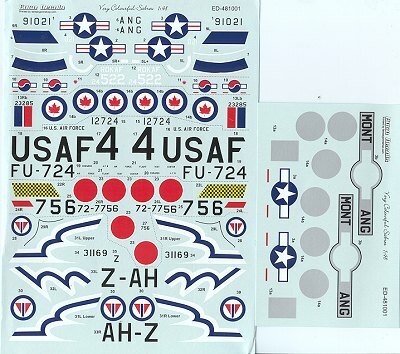 The 1/48 scale sheet is shown. Because of the way the instruction sheets are laid out, it is not possible to show you all the schemes. I should also mention that my sheets arrived in rather wrinkled condition from mishandling in the mails. Though no cardboard reinforcement was provided, they were well packaged and should not have been so damaged. There are a lot of kits out there for the Sabre, including 1/48 kits by Academy and Hasegawa and Monogram. In 1/72 there are Academy, Fujimi and Hobbycraft kits. Stay away from the 1/72 Hasegawa kit as it is quite poorly done, unless you want to rob it for the F-40 wing. The decals themselves are superbly printed and a separate sheet provides the metallic bits needed for one scheme. Instructions are quite colorful and done on a heavy paper stock. Color info is privided for several paint lines as well as FS 595 numbers where appropriate. First is an overall red Canadair Sabre 5 from 1955. Apparently this was a display aircraft and a fetching scheme it is. The silver surrounds for the insignia are supplied as separate decals, a very nice touch. Next is a Japanese F-86F-40 (you’ll need the longer winged kit for this one) from 1 SQ JASDF. It has large red bands on the nose and mid-fuselage. From 332 Sq of the Norwegian Air Force comes a very colorful display bird from the Joker Aerobatic team. The white and blue bits are provided on the sheet and the red bands will have to be painted. The decal maker guarantees that the whites are so opaque that there will be no bleed through. The nose of this plane is painted a bronze which will have to be mixed. An overall yellow F-86A target tug from 120 FS, Montana ANG is the next plane. This will need the Cutting Edge conversion set in 1/48 and perhaps one could suffer through with the Matchbox F-86A in 1/72. The blue bands are all decals though one may wish to paint them as some cover rather convoluted surfaces. From Edwards AFB comes a bare metal F-86E with a day-glo nose that was used during a 1951 closed course speed record attempt. Finally, a South Korean RF-84F from around 1970. This one is in the US SEA camouflage of FS 34079, 34102 and 30219 uppers with 36622 undersides. Again, one will have to hunt up a conversion set for the RF version and probably have to use a set of F-40 wings on it as well. Check references to be sure. Overall an excellent sheet that is rife with super schemes.